Many of the people using laptops, PCs, iPad and iPhone 6 on a regular basis will have heard of the application F.lux. It is a simple program that allows the user better control of the screen colour of the devices. F.lux allows desktop users to alter the colour display as well as the screen display brightness, allowing the eye to adapt to a night colour screen which will help in reducing eye fatigue or continuous squinting. 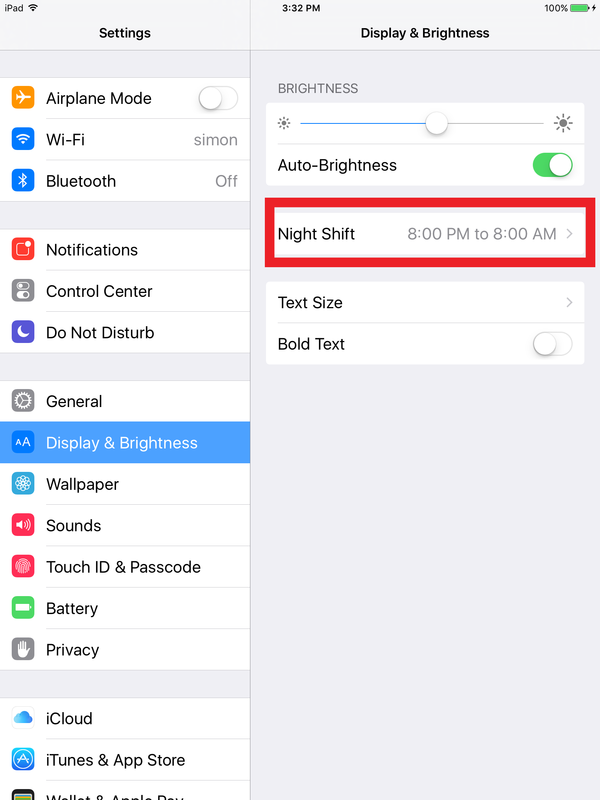 In iOS 9.3/IOS 10.2.1 Night Shift mode is an added features that is just like F.lux. After turning off the the iPad or iPhone 6, user will take additional 10 minutes to fall asleep. Unfortunately for users of iOS, no such app exists that allows complete control over the screen display of Apple devices. For many, this is quite the nuisance, as being in control of the display can be very important in reducing eye strain. For those who still want access to these great features, yet want to continue using the most up to date iPhone iOS devices, the only really option it to jailbreak the device- this is the removing of hardware restrictions for your mobile device, allowing unauthorised apps to be installed. As Apple does not allow iOS App to make system level changes, many users are forced to jailbreak the iPad and iPhone to allow apps more control and access to the protected feature of iOS devices. There is however, a way to mimic some of the functions of F.lux on iPhone 6 devices, and it is actually a very simple method, one that can be easily done by everyone who owns an iPhone or iPad without jailbreak. This method allows you to make your iPad more F.lux looking, which can help reduce the screen brightness on your iPad Air 2 or iPhone 6 Plus. In iOS 9.3 Nightshift mode – is an Alternative to F.lux and is alot more easy to do, won’t require xcode. During this setting, you can set it to a warmer colour. This setting will use GPS to determine what time of the day, so it’ll automatic turn on when it’s night time. Turning on Night Shift Mode by enabling Scheduled. This will automatically turn on Night Shift mode on the time you have set up. Tap onto Scheduled to manually set the time you want this feature to be enable. Set the time you want Night shift mode, and you’re done for iOS 10.2.1. And there you have it; it really is that simple, so now you know how to do it, you might be think why would I even need this function? Well, to begin with, there is the aspect of control. Being in full control of every aspect of your device is very important. Who wants a mobile device that limits what they can do? There is another more scientific reason why people would want to be able to reduce their backlight and screen display brightness. When reading at night time, our bodies will find it far easier to read (and therefore process) the information we take in whilst sitting in the dark. Our sleep cycles can be deeply affected by interruption of lights during the night time. It could be leaving your laptop or desktop one overnight, or maybe leaving your mobile on, which can constantly light up with notifications and the like. Humans have evolved to naturally rely on the day and night cycles, it is why we sleep when it is dark and get up in the mornings. So when these stages are interrupted by lights, it can have adverse side effects on a person, without them even realising it. It affects out circadian rhythm, which involves our internal cycle of biochemical, physiological and behavioural processes. Light (and a lack of light at night time) therefore plays a very important role in our sleep cycles, meaning we should do all we can to reduce these interruptions, another reason why the ability to manipulate the low light display is so important. Actually if you enable the “Zoom” feature in your iPad, you can then adjust the brightness level. –Open Settings → General → Accessibility. –Tap the Zoom section, and enable the Zoom switch. You should now see a Window Zoom overlay on top of the screen. –Perform a three-finger triple-tap on the screen to access an additional overlay with zoom controls. –Tap Full Screen Zoom, and use the slider at the bottom of the overlay to zoom all the way out if necessary. –Tap Choose Filter and select Low Light. –Go back to the main Accessibility section of the Settings app, and scroll down and select Accessibility Shortcut. –Tap Zoom for the Accessibility shortcut to assign a three finger-tap to the Zoom setting. –Triple-press the Home button to quickly switch between brightness. With the zoom set up with a low light filter, it’s possible to reduce screen brightness on demand using a simple triple-press of the Home button. I just upgraded to 9.3, and there is no such setting on my iPad air2. What’s the deal? If I have to have a new iPad to get this feature, I’m getting a Samsung. I installed f.Lux on my phone, no problem. You forgot to mention a key point: Night Shift is NOT available for all (many) iPads. Kind of essential information on a site called “iPad help”. Same with my iPad, even with iOS 9.3. Sad! I have to where Amber tinted lenses (I don’t normally wear glasses so it’s a hassle. Apart from that – great tip! I still miss f.Lux on my iPad (it is a life saver for late night working on my laptop, I couldn´t believe it the first time I tried turning it off midway through a night session). However being able to turn down the light this quickly on my iPad is a workable alternative.